Former CEO of the Rehab group, Angela Kerins, arrives at the Four Courts (March 2018). WHAT WILL TODAY’S Supreme Court ruling mean for one of the Dáil’s most powerful committees, the Public Accounts Committee? The Supreme Court ruled in favour of the former CEO of Rehab Angela Kerins when it said that the courts did have the power to intervene in issues related to Dáil hearings. 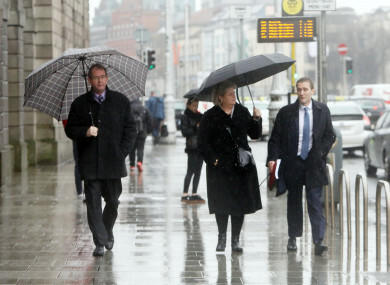 Kerins had sought damages from the State for distress, public humiliation and the loss of her career following her appearance before the Public Accounts Committee in February 2014. She resigned as CEO of Rehab on 2 April 2014. The case raises questions about the constitutional separation of powers that exists between the Dáil and the courts, and committees’ roles to hold figures to account. It also deals with similar constitutional issues as O’Brien v Clerk of Dáil Éireann, where businessman Denis O’Brien is challenging Dáil privilege (a power that allows politicians to make comments in the Dáil that otherwise could be challenged as defamatory, for the benefit of the public’s interest). The Public Accounts Committee, or PAC, focuses on “ensuring public services are run efficiently and achieve value for money”, according to the Oireachtas website. The “powerful” Dáil committee is defined in Section 2 of the Houses of the Oireachtas as “the committee of Dáil Éireann established under the rules and standing orders of Dáil Éireann to examine and report to Dáil Éireann on the appropriation accounts and reports of the Comptroller and Auditor General”. But in recent times, it’s come under examination itself: it’s been accused of straying “significantly” from its remit, repeating the work of other Oireachtas committees and being used as a microphone for members to voice opinions on a particular topic. In a recent interview, former HSE director general Tony O’Brien accused the PAC of “corroding public life with their antics” and not adding “any value”. “What it does, is it chases every passing controversy, and pay no respect to individuals,” he told RTÉ’s Marian Finucane Show. In 2011, 53% of the electorate voted in a referendum against increasing the powers of Oireachtas committees that would have given them the power to conduct more meaningful investigations. It had been argued that this could set up a second, separate justice system. Now, both the Oireachtas Committee on Procedures and Privileges and the Chief Justice Frank Clarke have come to the conclusion that the PAC had strayed from its remit in the Kerins case. The Rehab charity (which is going to be rebranded) receives funding from a number of sources – including the HSE, state agency Solas, and the Department of Justice and Equality under the Charitable Lotteries Scheme. But it remains an independent entity operating in the private sector; Rehab was also not under the remit of the Comptroller and Auditor General, and was never audited by him. Payments made by Solas to Rehab for the provision of Specialist Vocational Training. During the seven hours where Kerins appeared before the committee, Kerins was “accused of adopting double standards” and was told that she needed “to get a grip on herself”. “It was described as ‘incredible’ that her solicitors should correspond with the PAC in advance to advise it of the extent of its remit,” the judgement quotes. David Kenny, an Assistant Professor in Law at Trinity College Dublin told TheJournal.ie that he believes two things could happen as a result of this ruling: either there are more cases like the one taken by Kerins, and/or Dáil committees will become more cautious and conservative in how they conduct their business. But in practice there might be an effect, he adds. The reason this judgement is so significant is because Oireachtas privilege is “extraordinarily well-defended”, Kenny says, adding that judicial oversight into how a Dáil committee conducts itself “goes to the heart of its legislative power”. The High Court gave a judgement that there would be no oversight, and now the Supreme Court has given a more nuanced judgement, saying that it won’t intervene very often or very readily. It’s more likely that we’ll see more cases of this nature, which will clarify how exactly it will intervene. “There’s concern that despite the court’s effort to balance their respect for the powers and privileges of the Oireachtas, there are problems drawing lines. “We can’t yet tell what effect it will have,” he adds. The case is due back in court in April. Email “'Chilling effect': What could the Kerins case change about Dáil committees?”. Feedback on “'Chilling effect': What could the Kerins case change about Dáil committees?”.